There’s a phenomenon that has gripped the country (and possibly the world); it’s the hipster. Whether you love them, hate them, tolerate them, or maybe you don’t even really get what a hipster is, but trust me, they’re a thing. I think that they sometimes get a bad rap for being cliche, but I believe that there’s actually some really cool things we can take from the hipster mindset to help us be better creatives. I want to share those with you today. So what is a hipster? The definition has changed a bit over the years. The term was first used in the 50’s and 60’s to refer to the “beatnik” crowd. their peers to use art to express themselves. Webster dictionary defines the hipster as “usually young and artistic person who rejects the fixed morally binding customs of a particular group; moral attitudes; habits, manners) of conventional society”. existential thought, and creative expression. They went against the flow and wore black turtlenecks with dark glasses, read poetry aloud, and listened to jazzy music. They were not like the hippies, they were their own and did their own thing. Beatniks were hipsters, but today’s hipsters are not beatniks. Today’s hipsters are more about the community of others like them, not necessarily pushing an agenda. But like the Beatniks before them, who placed emphasis on individuality and creative expression, hipsters also place a high value on certain things. A hipster is usually recognized as free-thinking, chill but expressive, artistic, and somewhat politically and environmentally aware. something more authentic- something tangible. They like to shop at thrift stores, use old or new versions of old equipment like cameras, records, record players, etc. Similar to the beatnik, they are recognizable and all have somewhat of a “uniform”. A picture of a hipster might have a person wearing traditional clothes but worn differently, with fashionably messy hair (the “I just rolled out of bed” look). They like boots with skinny pants and flannel shirts or leggings with flowy short dresses with funky patterns. Hipsters usually hold some value and are very opinionated about it. or obscure movies, the hipster is stubbornly opinionated. So what can we learn from the hipster? I know that being a hipster these days is akin to following the crowd. If you’ve known me or read anything I’ve written for the last year and some change, you know that the last thing I will ever do is tell you to follow the crowd. that can actually help you to be a better creative. It can change your outlook. What does that mean? I think that something cool about hipsters is the way they see the world. They see a mid century beat up table at the thrift store and see potential. They hear an obscure band on Spotify and are drawn to something that has not been recognized yet and they embrace it and share it with their friends. see the world through some Buddy Holly glasses, so to speak. I’m slowly learning how to change my own outlook in my work. I am trying to be more easygoing (another hipster trait) when it comes to how I approach my personal projects especially. I still utilize my process, but I’m trying to be a little more forgiving and letting my well-trained intuition take over sometimes. Changing your mindset and trying to see the world from another angle is always going to benefit the way you work and create. Hipsters are always proud of the fact that they discovered a new band or musician or movie. They pride themselves on what is unique about them even though as a group they all seem ubiquitous. The same should be true of us as creative’s and designers.We should be looking for what it is that makes us unique. makes you, you? What is in your heart that you alone were meant to create? Something special has been created inside of each of us, a secret mission of sorts, and we have to figure out what that uniqueness is. And once we do, it’s up to us to share that with the world. When we are authentic and find our place in this universe of other unique and creative people, we will be more fulfilled and satisfied in ourselves and our work. You must know the trends and understand them before you can make them your own. Find new things or create them before someone else does. A funny thing about hipsters is that they like old things (aka “vintage”), but they really want to be seen as their own kind of trendy. and then ads bits of themselves to those tends. So maybe they are looking for slouchy boots; there are dozens and dozens of specific styles of the same boot. The boot is the trend, but choosing the one with maybe polka dots or a flower pattern inside the boot is what makes it all their own. Especially when combined with other wardrobe elements chosen the same way. them in our own unique ways before they can truly be ours. There’s something of a paradox that exists in the hipster mindset. The idea of being up to date with technology while at the same time being a collector of and often a user of vintage technology (record players, Polaroid cameras, etc.). The thing about this paradox is that it is to me a picture of what I think every designer should strive to be in a few ways. be in the habit of going analog in their creative process. I talk often about the importance of using paper, sketching by hand, and reading physical books. This isn’t a new idea by any means but as funny as it is to align myself with the hipsters, I realized this is the hipster mindset. I want to read actual paper books instead of a tablet, buy physical magazines instead of the online versions, listen to vinyl records and write with a nice pen in a beautiful sketchbook or journal. All of these things are some habits that hipsters pride themselves on, especially since many people don’t care for the old things. and I think that this can be very useful. When we sketch out our ideas by hand we tap into a part of our brain that wasn’t as easily accessed when we put a mouse in that same hand. When we read a book we put a limit on our research time while utilizing our sense of touch as we turn pages and our sense of smell in the print of the pages. There’s something inspiring that happens when we embrace old ways of doing things. 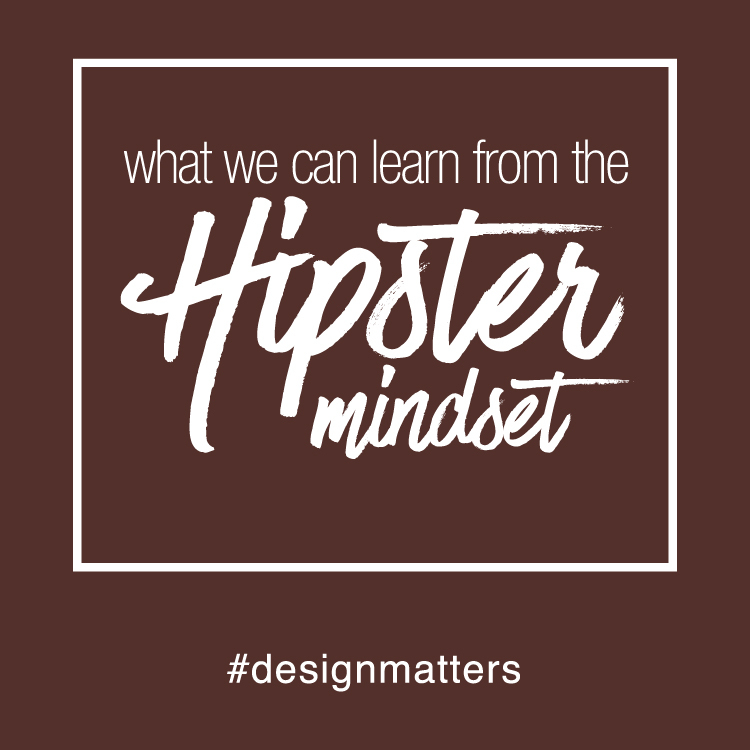 To conclude, I hope that you find ways to take some things away from the hipster mindset to make you a better designer, creator, and idea-maker. Change your outlook, value older ways of doing things, and remember to try to see hipsters and everyone around you as someone you could learn something from. Be willing to learn to be a better designer from all different people and places and things. Design is a wonderful world. I hope you’ll join me here, because design matters.